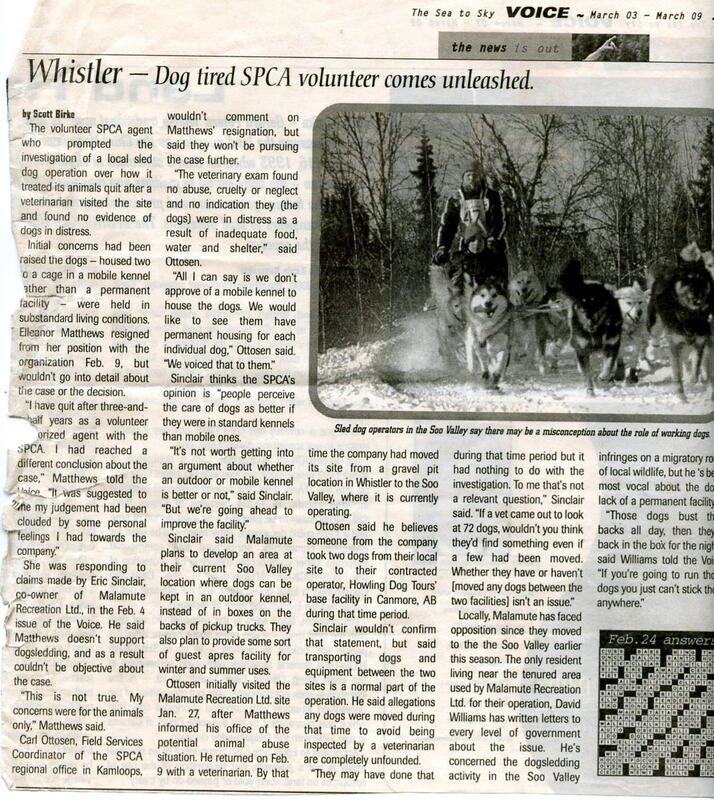 When Eleanor Matthews was an BC SPCA field agent from 1997 to 2000 she covered the Pemberton area, Mount Currie and Whistler. (All photos were given to the SPCA.) 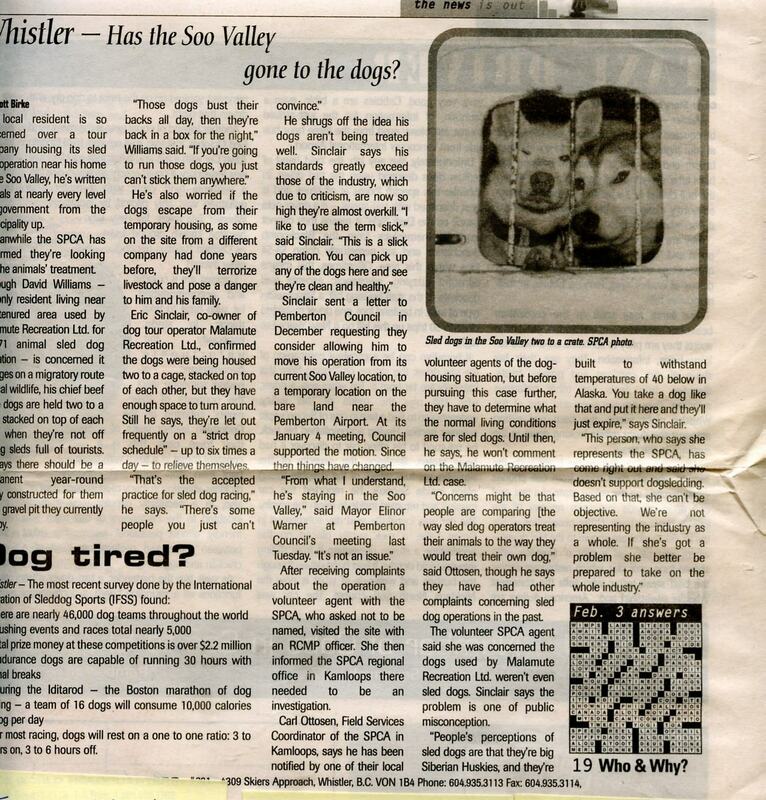 In 2006, after her efforts to have SPCA head office properly investigate what she had documented had failed, and after having her report published in local Whistler newspapers and still no meaningful action from the SPCA, she sent her whole file to AAS. We published it and we had several phone conversations with her in which she told us some her questions about why the SPCA, as Eleanor said, "was sweeping this under the carpet". Though many complaints were made over the years, still no meaningful action was taken by the SPCA until the dogs were dead. 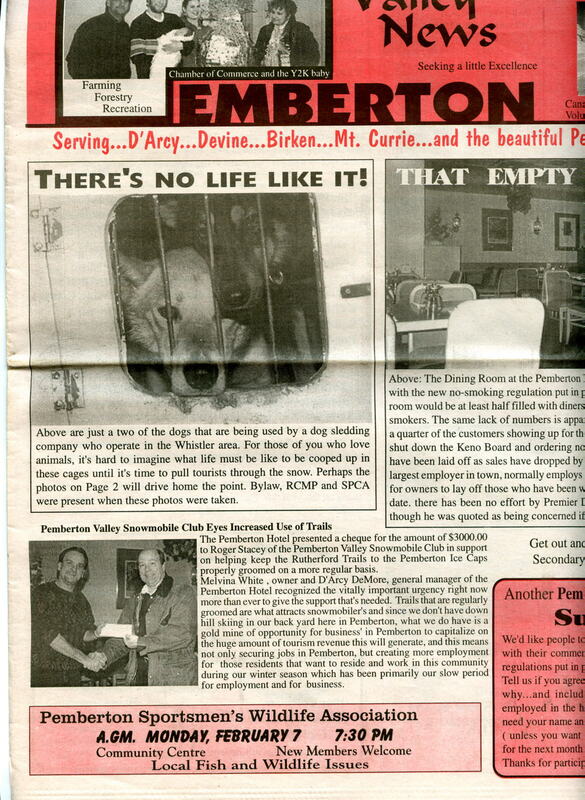 (The secretive SPCA, though an agency of the government by the act of having statutory powers granted to it by the BC government long ago, refuses to give certain information the government requests about its enforcement activities, so there is no way to know how many complaints it received over this long period, but there were many and the SPCA knew that when someone told them Fawcett's dogs were in bad shape that in fact they may have been in "distress" the offence under the Prevention of Cruelty to Animals Act (PCA Act.) and could have been seized many times in those years. 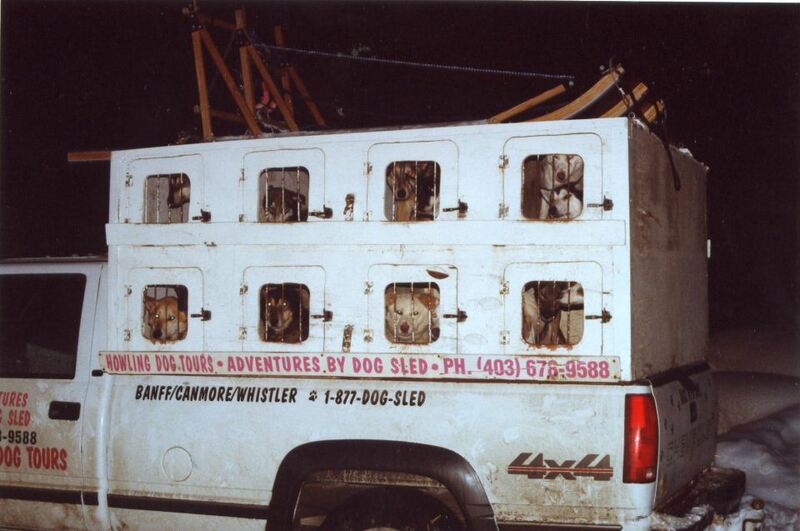 In 2000, Eleanor Matthews had a complaint from the public about 73 sled dogs belonging to Robert Fawcett's Howling Dogs Sled Dogs company that were being kept in crates on the back of two trucks. The crates are suppose to only be used for transport to and from snow sledding jobs, but were being used to keep the dogs in, rather than in proper, permanent kennels. Not all got out every day except for their one meal. 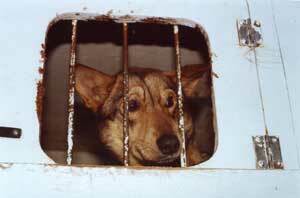 Some crates had two to three dogs in them. When Matthews went to investigate she was alarmed at the condition these dogs were being kept in and was told by the owner/operator that the dogs only got water once a day in their food. This was not only alarming but contrary to the SPCA's own stated kennel standards. 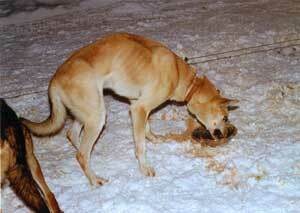 All the dogs were underweight as can be seen in the photos. Matthews also believed that Howling Dogs owner, Robert Fawcett, bought some dogs from SPCAs and that he was "in cahoots" with the SPCA in some way. If true, that would be a reason to leave Fawcett alone, not charged, keeping him out of court where the SPCA's involvement in his business, whether by supplying him with dogs or by keeping him in business by not ever shutting him down, would be exposed. Matthews kept the pictures and the newspaper clippings of this complaint that the SPCA swept under the carpet which she gave AAS in 2006. She quit her unpaid volunteer job as an agent for the SPCA because she refused to work with an organization that does not do what they tell people they do. 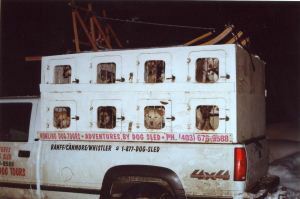 According to the Whistler Question (in an article written on April 1, 2009), Dr. David Lane investigated Fawcett's sled dogs on behalf of the SPCA: "Dr. Lane does four kennel visits a year and those reports are sent to the SPCA." Animal Advocates attended the sentencing of Robert Fawcett on November 22, 2012, and we learned that Fawcett's vet was also Dr. David Lane. So Fawcett and the SPCA were using the same vet to check on Fawcett's dogs. - John van der Hoeven, the then Head of SPCA Cruelty Investigations, told her that he didn't see any signs of dogs jammed in crates in spite of their agent's photographs and statement. - That the SPCA received "constant complaints". WAGS, the Whistler pound, also said that when it received any of many complaints it always told the complainant to report it to the SPCA. 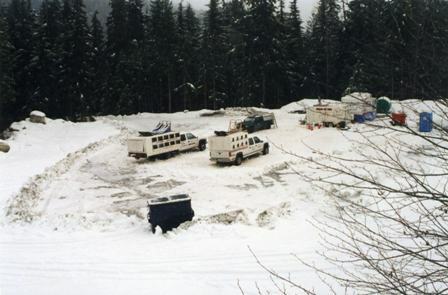 Eleanor Matthews admits that she has violent thoughts about the Whistler sled-dog killer. It’s my soul that has been destroyed, she tells herself, not his. 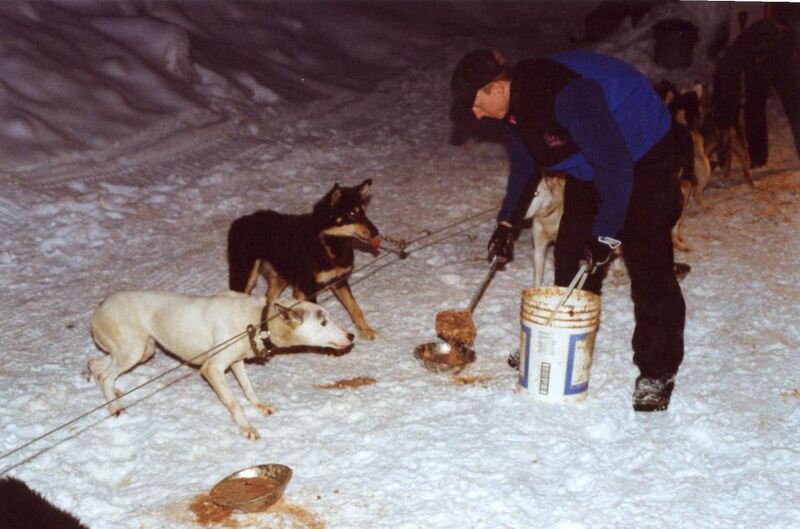 Matthews thinks back to her inspection in January 2000 of 73 sled dogs owned by Bob Fawcett. As a B.C. 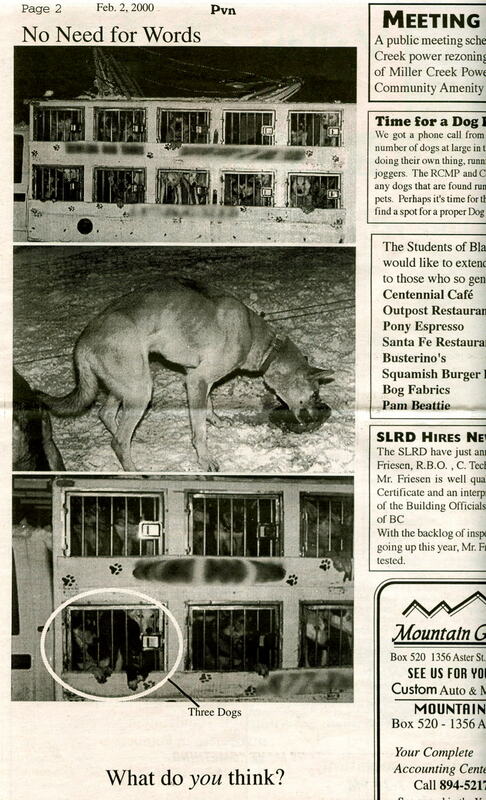 SPCA volunteer living in Pemberton, she went to a snowy Whistler gravel pit and took pictures of dogs in cages stacked on top of each other in two trailers that resembled rolling prisons. Two dogs jammed into every caged box, each a little prison measured at about 45 centimetres in width and one metre in depth, according to her investigative notes. One of the compartments had three dogs stuffed in. Their paws hung through metal bars and their snouts poked out. She could sense their hunger and their eyes were sad. Some dogs were bone thin. Fawcett is the one that should be locked in a cage without room to turn around, Matthews sometimes tells herself. She even wrote it on her photo evidence package, years ago. When Fawcett is sentenced Nov. 22 in B.C. Provincial Court in North Vancouver, Matthews hopes and prays that he will be sent to prison for the lives of 50 dogs, and for the trauma she feels. She torments herself with the question: If only the SPCA had followed through on her investigation, how many dogs would have been saved? Fawcett pleaded guilty in August to a criminal charge of causing unnecessary pain and suffering to animals. The maximum sentence is five years in prison and $75,000 in fines, although legal experts say prison is unlikely. Investigation into Fawcett’s crime started in January 2011 after documents from his successful WorkSafe B.C. compensation claim came to light. The documents described a bloody slaughter, with about 100 dogs shot or slashed to death and dumped in a mass grave over a two-day period in April 2010. 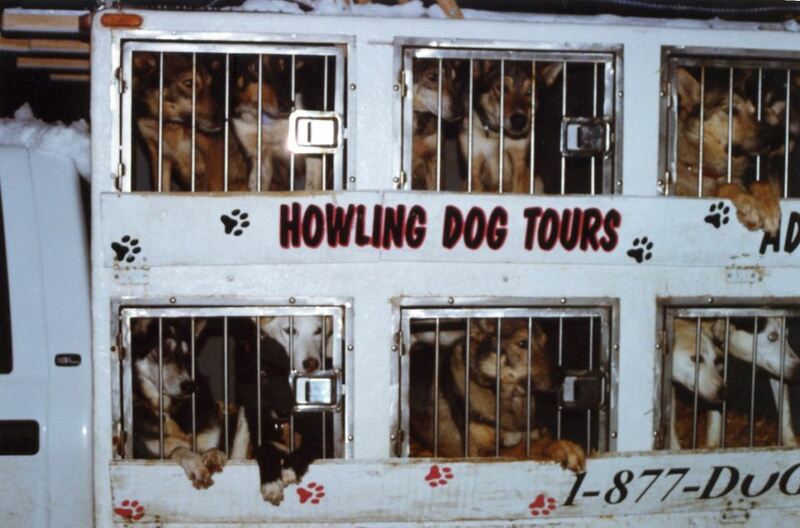 Fawcett, who was then general manager of Howling Dog Tours, claimed he was following corporate orders for a mass cull because of depressed demand for dog tours after the 2010 Olympic Winter Games. The company owners said at the time that they were aware of the euthanasia of dogs but expected it to be done in a humane manner. Matthews, now 56, says she joined the SPCA as a voluntary investigator about 14 years ago. It is a non-professional position that no longer exists. She contacted The Province to share her investigation notes and the photos she took in January 2000, when she says she visited Fawcett’s operation, bringing along her husband and an RCMP officer. Matthews passed her investigative report to Carl Ottosen, field services co-ordinator of the SPCA regional office in Kamloops. She says that, shortly after her visit and questioning of Fawcett, he called her and proposed a meeting, suggesting a solution to her investigation. Matthews says she told Fawcett there was nothing to discuss, the investigation had already gone up the chain. Matthews, who now lives in North Vancouver, says she has always been bothered that the SPCA didn’t take the case to Crown prosecutors. It would be the first of several times the SPCA told Fawcett it did not approve of his methods. But he always complied with orders and was never shut down. Marcie Moriarty, general manager of cruelty investigations for the B.C. SPCA, said in an interview Friday that it was much more difficult to prosecute animal-cruelty cases in 2000, and Fawcett has been investigated more than once over the years. “We did give Fawcett’s organization orders and they were complied with,” Moriarty said. That answer doesn’t satisfy Matthews, who says she quit Feb. 9, 2000, after three years as a volunteer SPCA agent, because she was informed that her case against Fawcett was dropped, and it was suggested her judgment was clouded by personal feelings. The sting that lingered increased exponentially when Fawcett’s gruesome crime was reported. The B.C. SPCA is investigating two local dog sled tour operators following recent complaints from guests that some dogs appeared to be malnourished. Eileen Drever, senior animal protection officer with the SPCA, said she’s dealing with a couple of ongoing investigations in regard to sled dogs in the Whistler area and the conditions under which they’re kept. The SPCA has issued orders to operators and failure to comply could lead to legal action under the provincial Prevention of Cruelty to Animals Act, she said. “The SPCA’s not happy with the way these dogs are kept,” Drever said. She could not name the companies or provide further details because of the ongoing investigations. Though the SPCA has investigated local dog sled tour operators in the past, the current scrutiny is taking place after at least two people who took tours in January contacted the SPCA with concerns about the condition of the dogs and their care. Palm Springs, Calif. resident Sheree Porter-Thomas said she went on a dog sled tour with her husband when the couple was visiting Whistler in January. She arranged the tour through the Hilton but was later told the tour operator was Blackcomb Snowmobiles. Porter-Thomas said when the pair arrived for the tour she noticed how thin the dogs looked and the way they cowered away when she tried to pet them. The dogs did not appear healthy and Porter-Thomas said she could see their ribs and the bones in their heads. 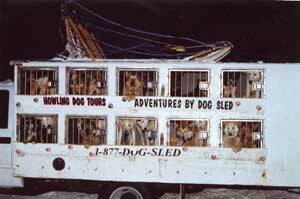 The dogs didn’t appear to want to be harnessed to the sled for the tour and they were pulling away, she said. Other guests remarked on how thin the dogs appeared and after the tour several were asking the guides about it, she said. They were told it was partly the dogs’ breed, that some of the dogs are finicky eaters, and they stay thin because they run so much. “They kept giving us these excuses,” Porter-Thomas said. 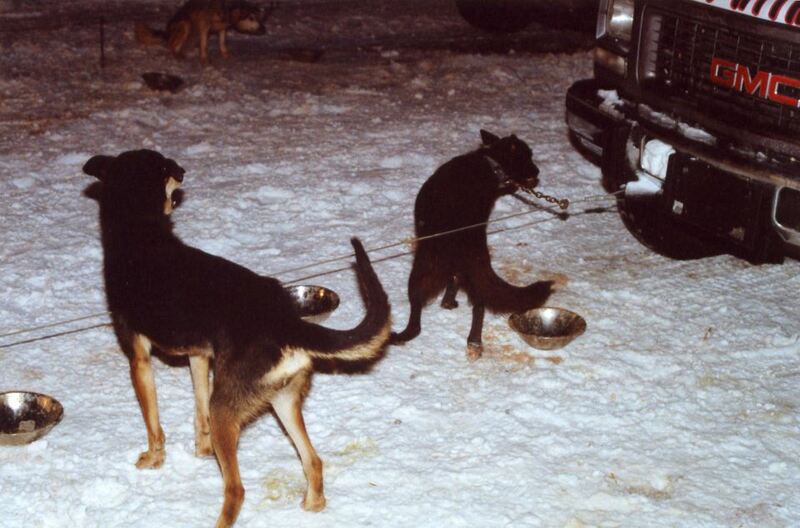 After returning home to Palm Springs, she wrote a letter about her experience to a Whitehorse-based organization called Sled Dog Watchdog and PETA. She then sent the letter to Whistler’s mayor and council and eventually got in touch with Drever at the SPCA, Porter Thomas said. Vancouver resident Tanya Vignal also sent letters to the mayor and council and the SPCA after a similar experience in January. She said she felt “guilty” and “sick” after taking a dog sled tour with Blackcomb Snowmobiles and seeing dogs that looked malnourished and unwell. 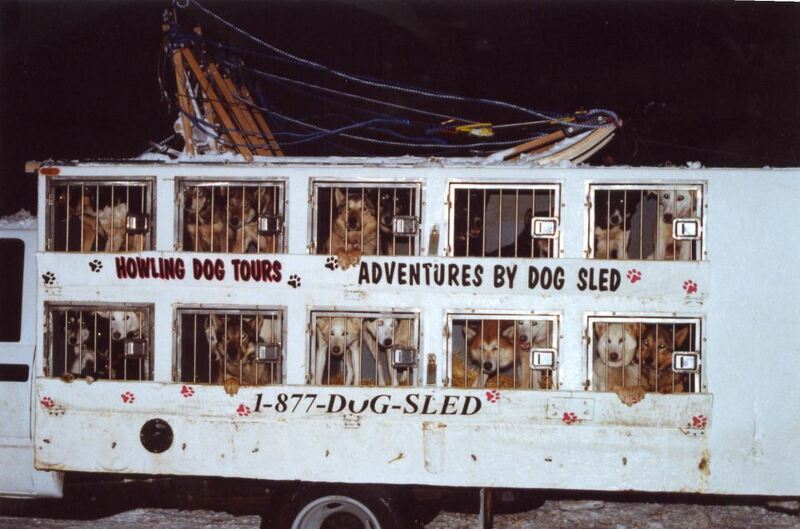 One of the dogs had diarrhea while it was pulling the sled, and the dogs weren’t provided with water to drink after the exertion of the tour, Vignal said. Blackcomb Snowmobiles President Shawn Wilson said he’s “hurt” that a couple of guests have concerns about how the sled dogs are being treated. Of all the local kennels the one his contractor runs is at the “top of the list” for care of the dogs, he said, and these are the only complaints he’s heard of all season. The dogs are approachable, mellow and “super fit,” he said. “We’re super happy with our dogs,” Wilson said. Tanner Moody is the contractor Blackcomb Snowmobiles hired this winter to provide sled dogs and do the tours. Moody, who has been in the dog sled business for about 10 years in the Whistler area and in Banff, said his “temporary” kennel is located in Mount Currie. He has 48 dogs — a small number compared with other local operators. 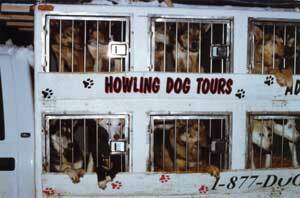 The dogs are kept in individual pens, not on chains, and most have insulated houses for the cold weather, Moody said. They’re fed premium, high-protein dog food and meat, and they’re seen regularly by local vet Dr. David Lane, who has given them a clean bill of health, Moody said. A message for Dr. Lane was not returned by The Question’s press deadline. “They’re getting food put in front of them probably about five times a day,” Moody said. They’re also given water regularly and the vet hasn’t reported any problems with dehydration, he said. Some of the dogs dropped some weight during a cold snap in January, he said. The dogs can also appear thin because they’re a husky/hound cross and they burn up to 6,000 calories a day, he said. He compared them to marathon runners. “A lot of them, yeah, they are lean but they’re right around the decent weight,” Moody said. Moody said he’s complying with the SPCA’s orders to have the dogs’ teeth checked, to increase their food amounts and to put them on a more effective de-worming program. Wilson said Moody is working with SPCA officers and is open to their site visits and follow up. Wilson also invited the mayor and council to take a tour and see the dogs first hand. Staff at WAG, Whistler’s animal shelter, and the municipality’s bylaw office didn’t know how many complaints have been received recently about local dogsledding operations. Kristi Broadbent, Whistler’s animal control officer, said because the various operators’ kennels are located in the Pemberton area and the Callaghan Valley, they’re under the jurisdiction of the Squamish-Lillooet Regional District. She said any complaints coming through the municipality are being referred to the SPCA. “They (the operators) are providing a Whistler experience so we definitely want to make sure there’s no ill treatment of animals,” she said. @jackieasante We also heard a lot of damning stuff in court about #BCSPCA failures, and negligence on behalf of ownership of company. 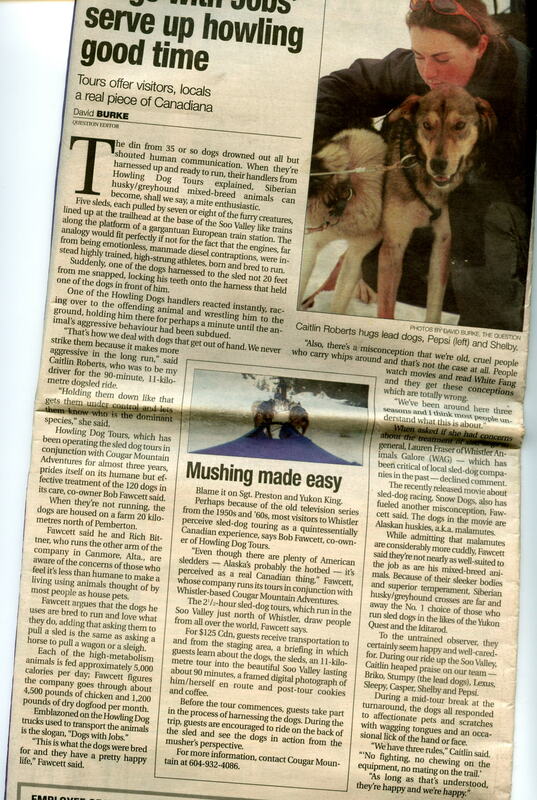 I have a lot to say about this #sleddog final chapter. I'll write something and get it hosted somewhere and tweet a link in days to come. SPCA didn't investigate after a report made in January 2010 by someone named Coughlan. SPCA didn't investigate after Fawcett contacted them, before he killed the dogs, asking the SPCA to rehome dogs and was refused. Another instance was given of the SPCA's failure to prevent gross cruelty: A neighbour witnessed a man repeatedly punch and kick and beat a dog with a hammer. When the dog got loose and tried escape, the man dragged it behind a shed and beat it some more. The SPCA was called but didn't come, so the RCMP were called and they did come.